A luxurious self-contained apartment, Song sleeps 6 people, and comprises the entire ground floor of Villa Sunsong in Villefranche sur Mer. It has lovely views over the Mediterranean, Villefranche Bay and towards Cap Ferrat. The large pool, sun terraces and gardens are south-facing with sun all day. Air conditioning throughout. Villa Sunsong is south-facing, thus offering the gorgeous French sun all day long. Located behind electric gates with a video entry system, the property has private parking for 6 cars, and a private 12m x 4m infinity pool, which can be heated. The ground-floor, Apartment Song, has a spacious open-plan lounge and dining area. Exit through a door to a sun terrace which is equipped with a dining table, sun-loungers and even a herb garden! All of the rooms have electric heating and air conditioning units. There is UK TV and a DVD player available in the lounge, as well as WiFi internet throughout the property. The queen-size bedroom offers a beautiful sea view and has room for a child's cot which is available on request, as well as a high chair. A walk-in shower room with WC is next to this. There are two twin/single bedrooms - two of these beds can be connected and made us as a double, should you require it (please ask in advance). Between these rooms is a bathroom equipped with a bath/shower and a separate WC. The outside area of the property, set in 2000m² of private grounds, is impressive thanks to the 12 x 4-metre private infinity pool, with built-in steps and ledge for easy access. The pool has an immersion alarm for Child Safety and is not overlooked so you can sunbathe in private. There are plenty of sun-loungers and comfortable sofas to relax on, as well as parasols to give you some shade. There is a pool-house which is equipped with a shower and WC. The swimming pool is surrounded by a tiled terrace, there is plenty of space around the pool and the garden offering sunshine or shade. One of the great things about the swimming pool area is that there is atmospheric lighting throughout as well as in the garden and BBQ area, making it a wonderful place to dine. The garden is large and dusted with Mediterranean plants and trees, as well as plenty of flowers such as roses, and a swing chair. There is always something in bloom throughout the year, making this property a very beautiful place to stay. The barbecue area is equipped with a stone barbecue and dining tables, under the shade of some trees. There is parking for up to six cars, secure behind electric gates with Video entry-phone. Apartment Song, has a spacious open-plan lounge and dining area. Exit through a door to a sun terrace which is equipped with a dining table, sun-loungers and even a herb garden! All of the rooms have electric heating and air conditioning units. There is UK TV and a DVD player available in the lounge, as well as WiFi internet throughout the property. Villefranche, Cap Ferrat and Beaulieu beaches are all within 10 mins drive. This area has some of the most spectacular views to be found on the Cote d'Azur. There is a bus stop 300 yards away for Nice and Beaulieu but a car is best. There is a very good restaurant, also just 300 yards away. Other restaurants and bars can be found in Villefranche and Beaulieu centre, where there is everything. This would be the same bus or less than 10 minutes by car. VilleFranche-sur-Mer has many places of historical interest plus restaurants and shops and is just two miles from the apartment. The apartment is perfectly placed for exploring the whole coastline. It is a 20 minute drive to Monaco, a little further to the Italian border. Less than 10 minutes to the three most exclusive bays of Cap Ferrat, Beaulieu sur Mer and Villefranche. The lovely coastal train can be picked up in either Beaulieu or Villefranche which will take you into Italy via Monaco or to Cannes via Nice. Golf courses available in Monaco and Nice within 15 mins drive. Nice Cote D'Azur Airport is about 30 minutes drive. There are International, TGV and Local trains from Nice or Monaco 15 to 20 minutes drive. A local bus stops nearby. The villa will be available after 5pm on the day of arrival and must be vacated by 10am on the morning of departure. Times may be flexible out of high season, please ask well in advance. If you require the pool to be heated (useful in Spring and Autumn) there will be a charge of £300 or 350€ per week. Please notify us in advance. Bookings in high season (July and August) commence on Saturday for a minimum of one week. From September to June bookings of three days or more are accepted, commencing on any day. Bookings of one month or longer are available at reduced rates. Taxe de sejour is charged at 0. 40 euros per person per night. A child's cot is available on request, as well as a high-chair. 12m x 4m private, heated infinity pool. Pool can be heated at extra cost. Please see Fees and Conditions information. Pool has "infinity" edge and safety barriers. My husband and I rented Villa Sunsong in April from the 14th-21st 2012 and as we numbered only 3 - hubby, baby and me - I invited my best friend from my schooldays to bring her family - who numbered 4 - to spend the week with us. That we were able to live in the same villa, yet separately, was perfect for us as we were able to breakfast and dine together as and when we wanted due to there being all the requirements in both of the apartments. The villa was lovely with its cool marble floors and the big pool was a great hit with the children and we all loved the view from the sun loungers. The villa was perfectly located as we could pop over to San Remo in Italy, where I have always wanted to go and it's a mere 40 mins away. On arrival at the villa, we were met by the owner's manageress who couldn't do enough for us. She showed us where everything was from the baby highchair to extra china in case we needed more! She was very kind and helpful and I got the impression that I could call her anytime, had I needed to. We will definitely be back to stay next year. This was a beautiful stay! Though when you look it up and go there the first time, it appears a bit far away because of several slopes in the mountain. However, with a rental car, this is the perfect location to explore the Cote d'Azur and have a great view over the sea. The swimming pool we only saw from the window as it was December and very cold. But at least we were able to imagine the beautiful views you have from the spacious terrace. All amenities including technical issues like TV for kids or Internet were in a perfect up-to-date-state and the heaters, once turned on for the first night, are sufficient to heat the house in the winter time. The furniture is Provencal and very clean, also is everything else in the villa. 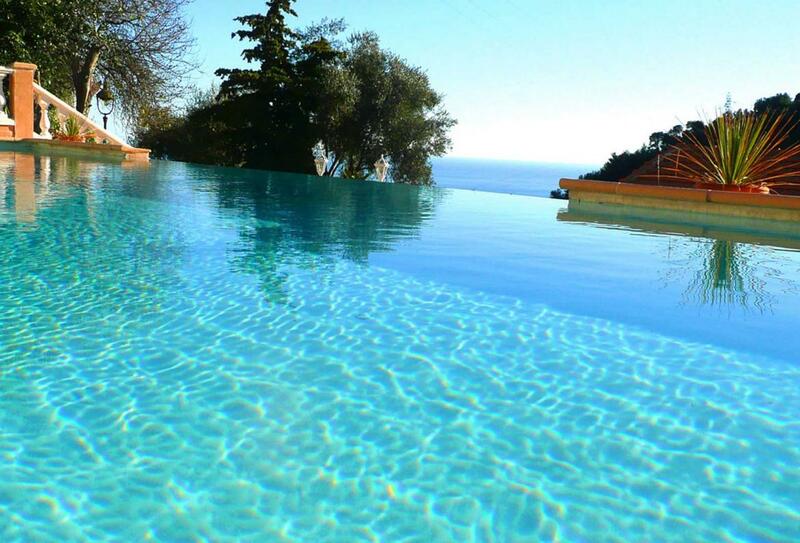 The villa is located very close to Nice, only 15 minutes drive or even shorter, so are Monaco and Eze. We were there on my mother's birthday and my brother and family came to visit the lower apartment as a surprise. For two families who come there together to have a joint stay, the villa is perfect. As the pool is located on the one side of the upper apartment only, to rent only one apartment in summer time is not recommendable. What a wonderful location. From the minute the doors opened onto the long gleaming marble hallway, we knew we were in for a treat. Spotlessly clean and very comfortable, the spacious accommodation allowed us to split up into groups so that the teenagers could be in the downstairs apartment while we oldies luxuriated on the main terrace. The downstairs apartment has a smaller terrace as well. Very comfortably furnished, luxurious bathrooms and adequate equipment. Remember to book beach towels for use at the amazing "Hollywood" pool. An excellent base to explore the Cote, we loved the Picasso museum in Antibes, and the antique shops by the port in Nice. A car is essential. Also driving up into the villages along the French/ Italian border was heavenly. I recommend a visit to Thiery, where we had a superb lunch at the hunting lodge and viewed the Alps from a special viewing spot high on a peak by the village church.